That, of course, isn’t the only thing Brichter is working on. As many iPad users know, Tweetie/Twitter has yet to arrive on the iPad in native resolution, but Brichter says it’s coming soon and, in fact, it’s so great that he wishes he could share some of the iPad code back to the Mac. "The goal is to exceed the Twitter iPhone app in the iPad," he said. "I swear the reunification is coming between iPhone, Mac, and iPad." That’s very good news – as I’ve still not seen a really outstanding Twitter app for the iPad. 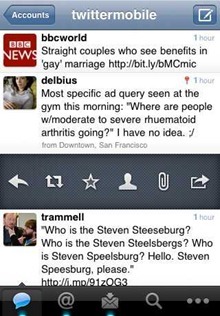 Twitterrific is the closest, but it just doesn’t feel as well done as its iPhone counterpart. 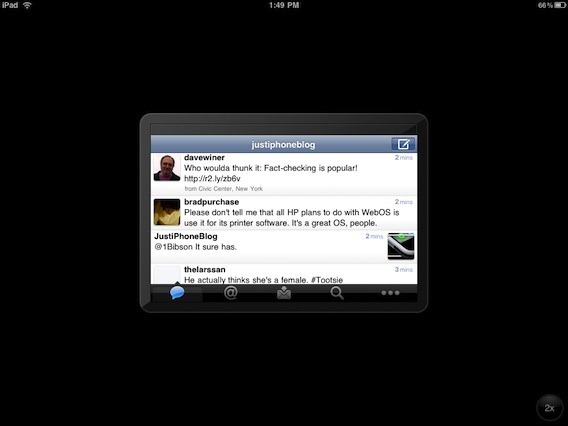 I’m looking forward to seeing Twitter hit the iPad. As many of you probably already know, the brand new Tweetie-based, official Twitter app for the iPhone was released this morning. We knew this was coming when Twitter bought Tweetie, and now the new app is here. The app is now free, which is great, contains all the Tweetie goodness many of us have come to know and love, and some new features that look promising as well – a dedicated Retweet button just as one quick example. Unfortunately, there is no full-on iPad version as yet, though the app is listed as ‘compatible’. So it will run on the iPad in the same way nearly all iPhone apps will – at iPhone size or in the rather lame 2X scaled-up mode. Here’s hoping the full iPad version is coming soon. In the meantime, you can find a few more notes about the new iPhone app over at our sister site. Many of us have been wondering when we’d see an iPad version of Tweetie, the superb iPhone Twitter app. Well … now we know there’s been a holdup on that: Twitter themselves have bought Tweetie and Loren Brichter (the app’s creator) is now a big part of the Twitter Mobile team. Loren will become a key member of our mobile team that is already having huge impact with device makers and service providers around the world. Loren’s work won the 2009 Apple Design Award and we will eventually launch Twitter for iPad with his help. Here’s hoping that eventually gets moved up to ‘soon’ in the not too distant future.